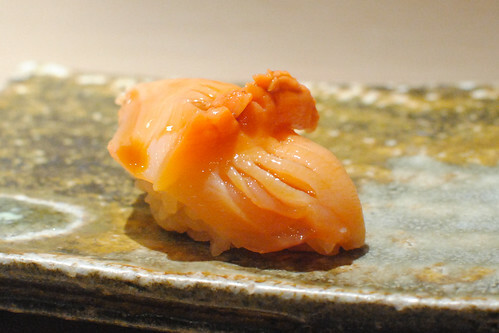 While I’ve had a fairly smooth experience dining by myself at various sushiyas around town, I’ve largely been missing out on a lot of the interaction and dialogue. It’s a key part of the experience, so I was excited to finally go to one with a Japanese-speaker (granted, I still didn’t understand most but at least got some translated). 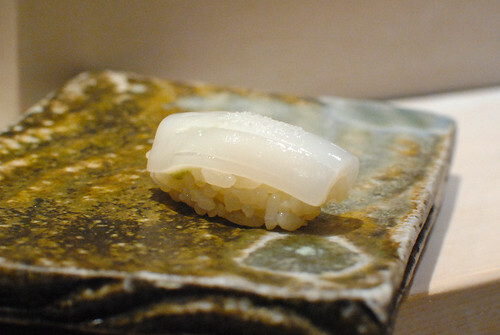 My friend Tomo was in town for part of my stay and picked out a restaurant for us to try – Umi, a non-descript small Michelin two-star sushi spot in Aoyama. 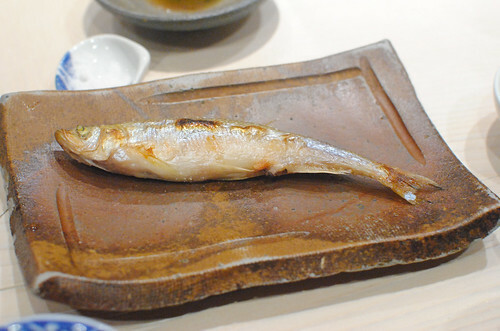 What separated Umi from other restaurants in the guide was the fact that it scored well on Tabelog, Japan’s Yelp-like user review site (which is supposedly more reliable). 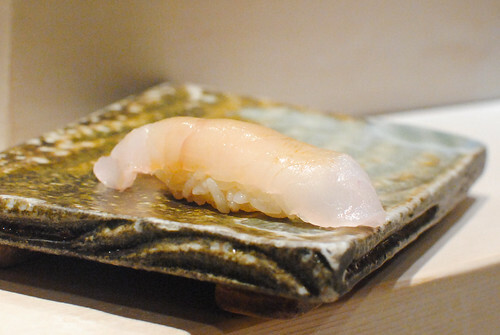 The sushi chef hails from Hokkaido so, naturally, much of the fish he chooses comes from this seafood-centric region. Even in Los Angeles, the area is well-known for its shellfish, so there were no complaints here. 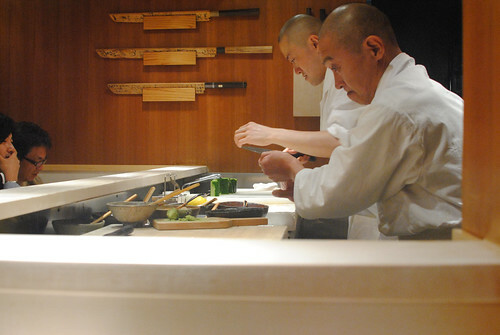 Impressively, the chef recalled the exact weight and locale for many of the fish prepared on this evening. 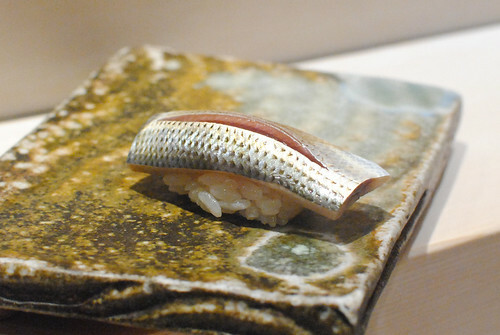 There were no stated prices or a menu, but the omakase was ¥21,000. 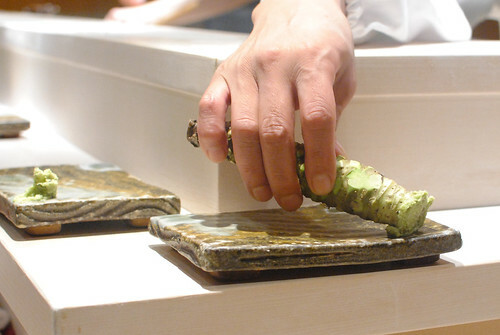 Real wasabi is much easier to come by in Japan. 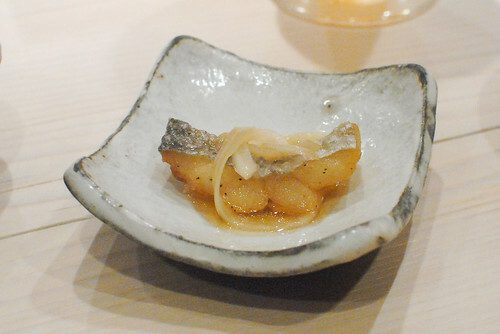 Cooked but served cold, this was a denser fish with an onion and dashi (I think?) complement. 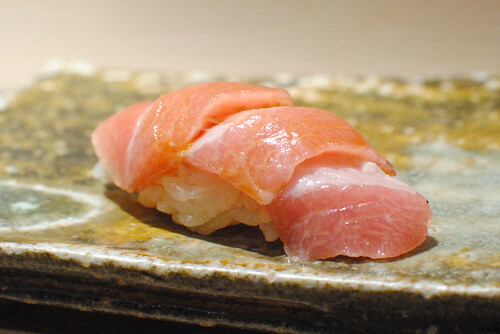 Often one of my favorite cuts, this was expectantly very tender with a nice fatty content. 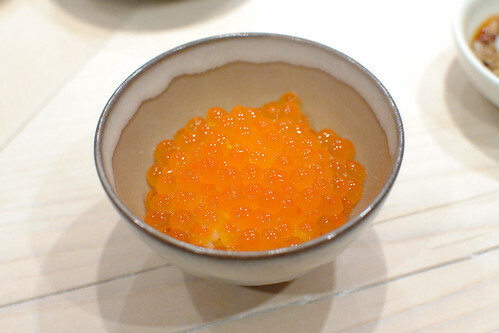 Soft and almost mushy in texture, I thought the roe had an interesting naturally subtle smoky flavor. This was the first of a bunch of shellfish on this night (particularly clams). 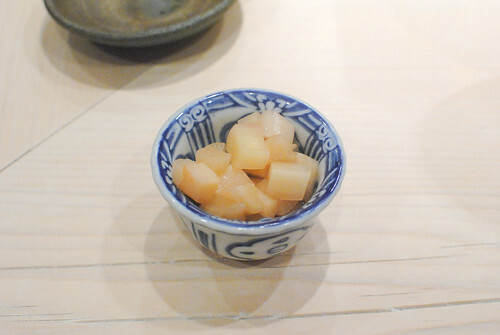 Two different parts of the clam were served, one with sea salt and one dipped into soy. The first was very chewy while the second was much sweeter and tender. 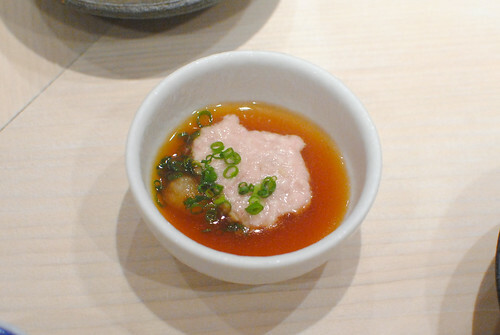 This was an interesting one, served with a dip of its own liver and ponzu. The sauce was mixed together and the fish dipped in, yielding some very delicious bites. 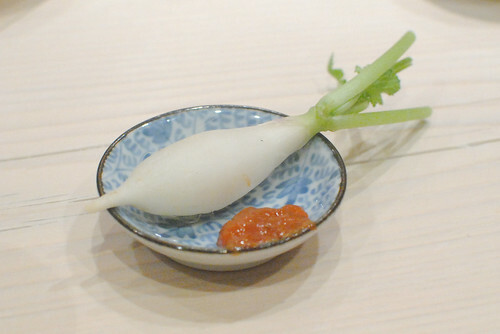 Slightly chewy with a clean flavor, complemented by a choice of soy or sea salt. I’m a sucker for green tea, especially when it’s iced. When I saw some some neighboring diners consuming it, I had to have it. 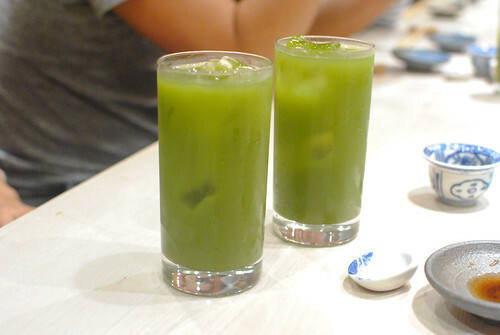 Only…this was matcha green tea and shochu. 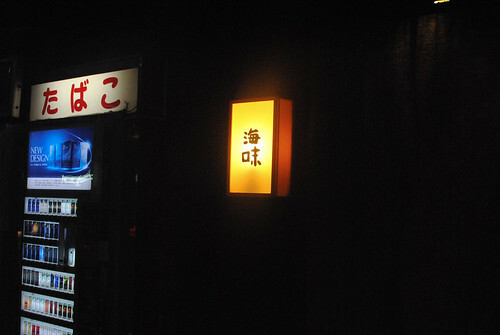 Apparently, tea and shochu is a common thing here (oolong tea works SO well). Green tea and shochu? Not quite as well…the green tea wasn’t strong enough to balance out the alcohol. Just a little bit of a crunch, though still tender, with a nice sea flavor. 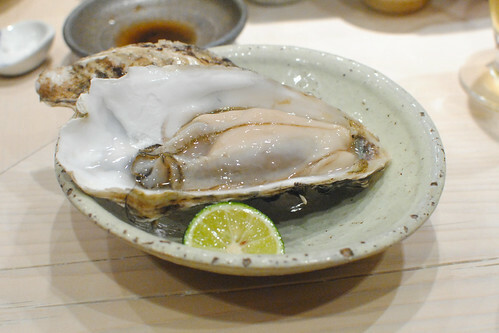 This was a huge oyster – talk about a mouthful. 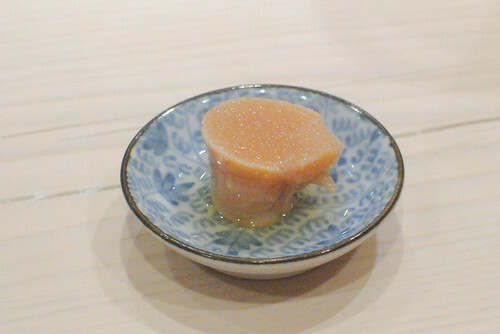 From Hokkaido, it was cool, creamy and delicious. A little bit of citrusy sudachi made a perfect duo. Salty with just a little bit of heat – loved the texture. Something else from Hokkaido, I thought this was excellent. 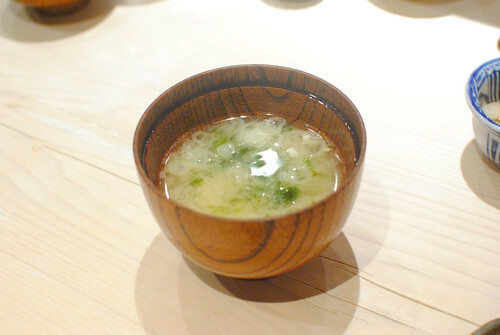 Cool, refreshing and not at all salty, it was served atop some warm rice. 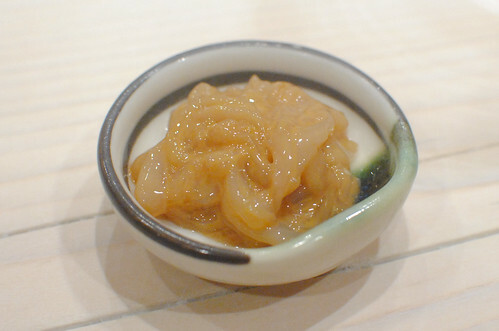 This was one of the best bites of the night, a gently smoked bonito dipped in a sauce made of soy, ginger and onion. 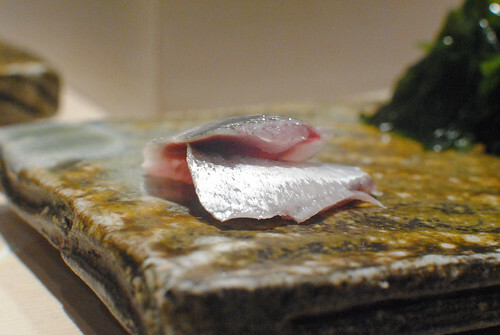 The fish was rich and fatty; the imbued smoke flavor just went so well with it. 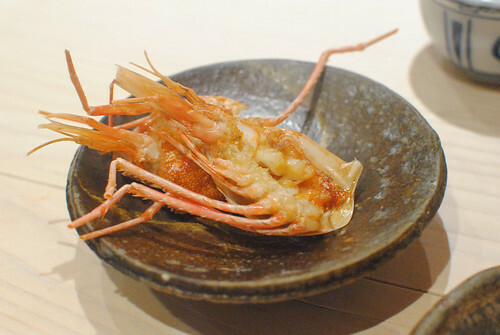 Crisp and fresh with a bit of a bite; I thought the miso was a welcome savory accompaniment. This was a unique one. 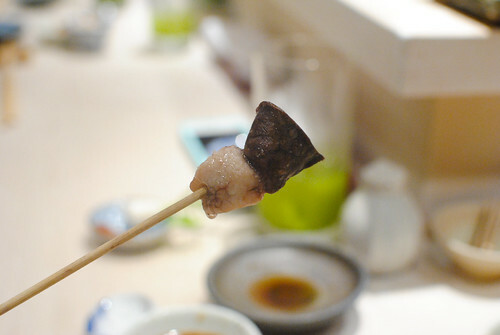 Chewy and soft, it had a texture very similar to beef heart without as much of a meaty flavor. I liked it. 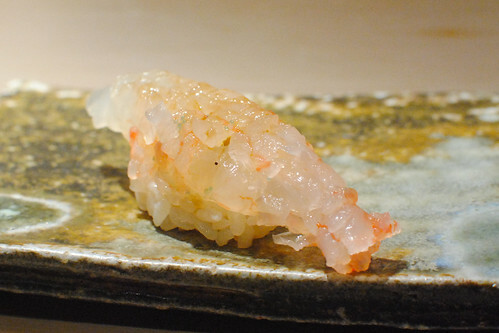 Soft and tender with just a little bit of citrusy yuzu zest. 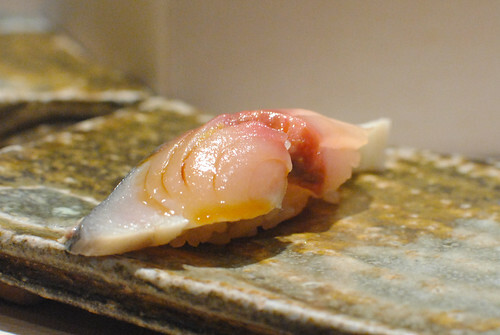 Rich and full of fishy flavor, this was a nice kohada. Another one that was really flavorful and kind of fatty in a good way. 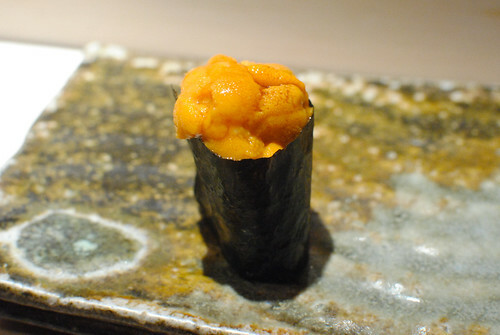 As expected, this uni was from Hokkaido and also excellent. 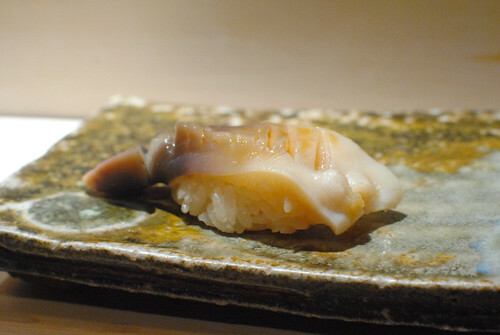 This was another clam – not sure I’ve had it before. It was definitely chewy and less sweet than the previous ones, but with a richer sea flavor. 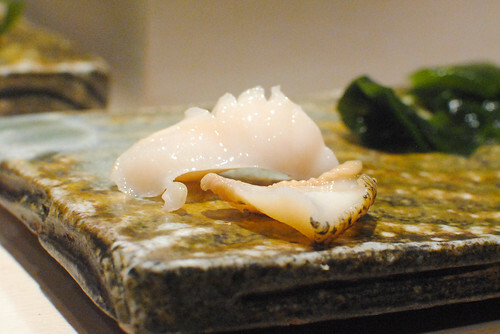 Another variety of clam – less of a chew but sweeter. Sweet and kind of spongy, I really enjoyed this. 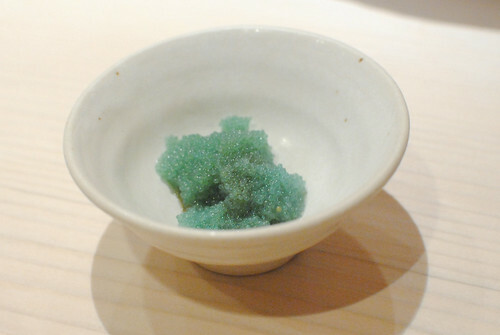 Loved that the roe was served too, displaying a nice texture and additional flavor dimension. 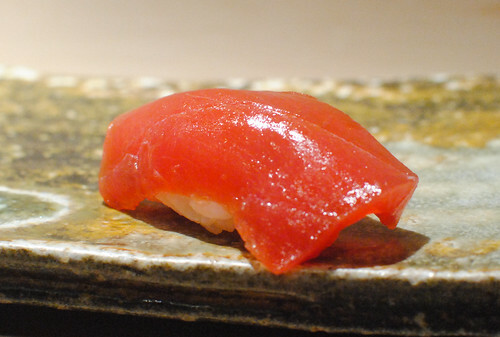 Soft, silky and fatty – an excellent example. We went leaner here and this was still excellent. It still had very tender flesh with good flavor. 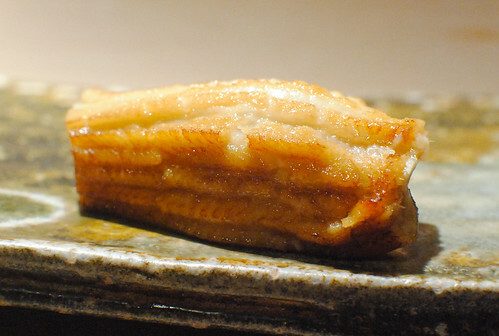 Some yuzu zest was sprinkled to offset the richness and sweetness of the eel and sauce, respectively. 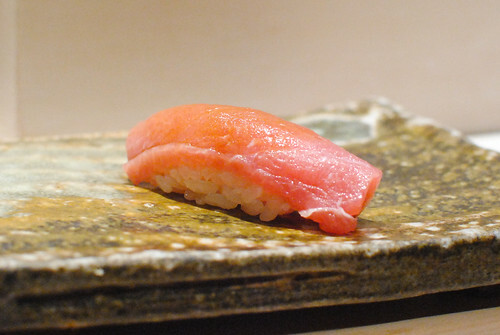 Melt-in-mouth texture…another excellent one. Beautifully cut, the cucumber was sliced so thinly to get a very nice crisp texture. The shrimp returned, fried. Crunchy. This was supposed to be our last dish of the evening. 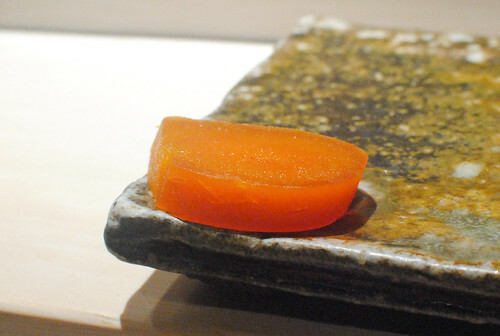 However, while chatting the chef revealed he’d been curing some bottarga and showed it off. When the patrons inquired about it, he let us all have a piece of the rare treat! 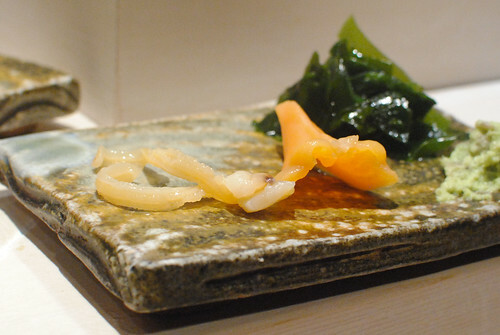 I don’t think I’ve ever had bottarga in this way. 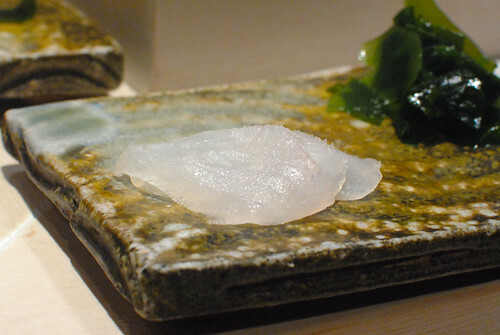 It had a soft, yielding texture that was almost gelatinous. 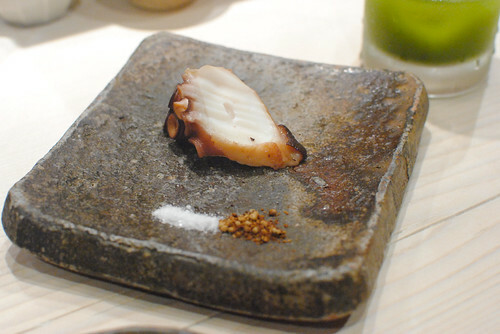 There was a lingering salinity and a subtle sea flavor, washed down with a bit of sake (the chef said bottarga had to be consumed with sake). 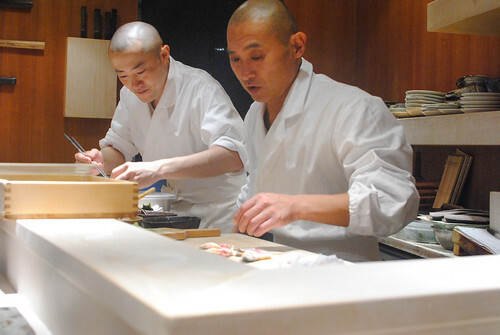 The atmosphere at Umi was lively and pretty chatty. 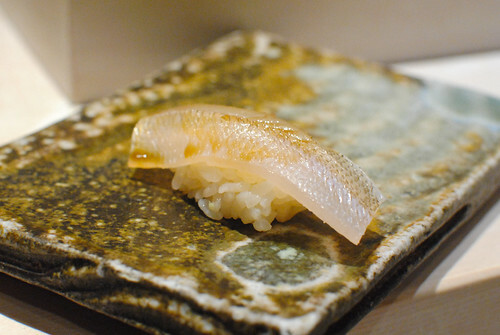 It was probably the most easygoing of any of the sushiyas I’ve been to so far; I just wish I knew more Japanese. Food-wise I thought Umi had some of the best fish quality I’ve tasted on this trip, but what really separated this experience was the variety of fish, particularly shellfish. 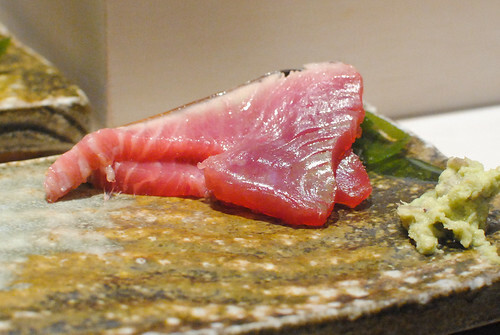 I counted about 30 different fish/cuts on this night, by far the most varied on this trip. 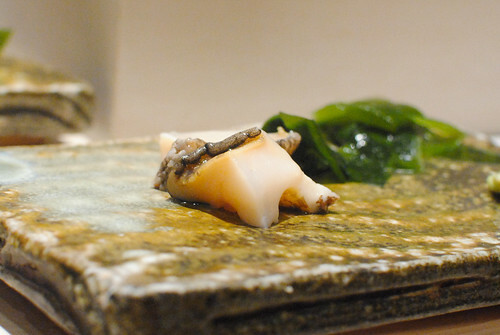 Highlights for me were the filefish dipped in its own liver and ponzu, oyster, smoked bonito, uni, botan ebi, anago, and bottarga. This won’t be a meal I’ll soon forget. 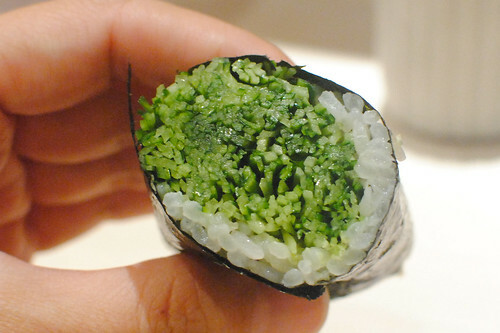 Best looking maki roll I’ve ever seen! The liver dip sounded outstanding. 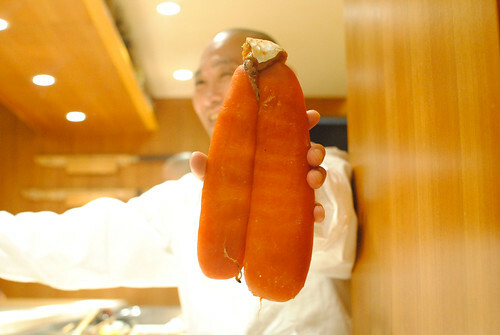 Haha thanks for the note; never seen bottarga in this way in US (but maybe I just haven’t been to the right places).